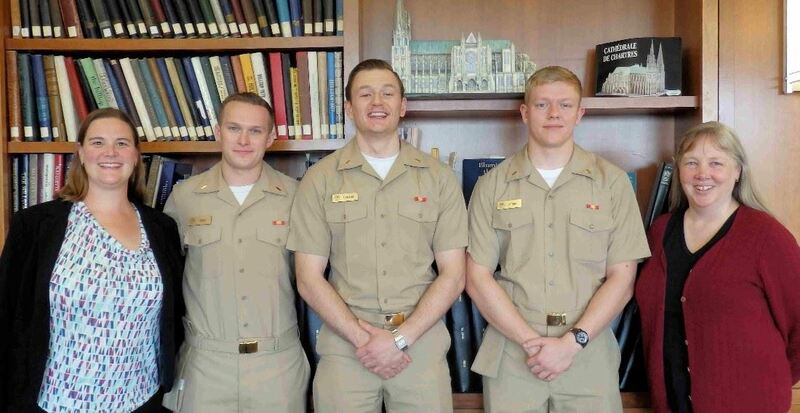 Midshipmen at the Unit have organized their 3rd annual golf outing Sunday, April 28, 2019 at New Berlin Hills. MU NROTC Alumni & Friends Association are a proud sponsor. Proceeds go toward the MU NROTC Battalion Activities Fund supporting Marquette Midshipmen with leadership development opportunities. From the event website: We had a great event last year, and we look forward to hosting another fun-filled event that brings the members of the Milwaukee community together with alumni, midshipmen, and their families. We appreciate your support to continue MU NROTC's tradition of developing great officers and giving back to the community. 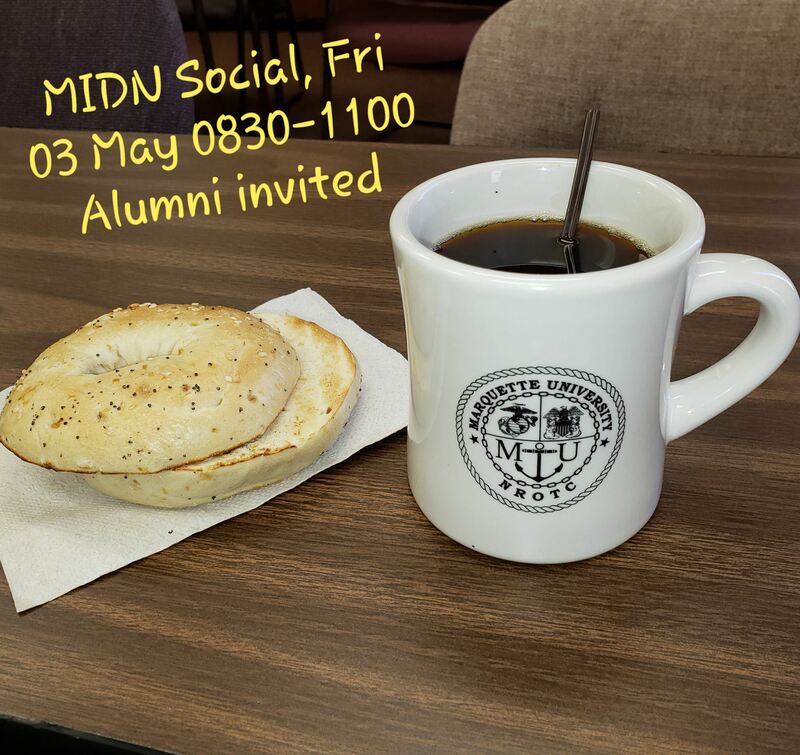 The Unit will be hosting a Bagels & Coffee Social for the Midshipmen before their final exams start. The event will be in the Wardroom from 0830-1100 on Friday 03May. 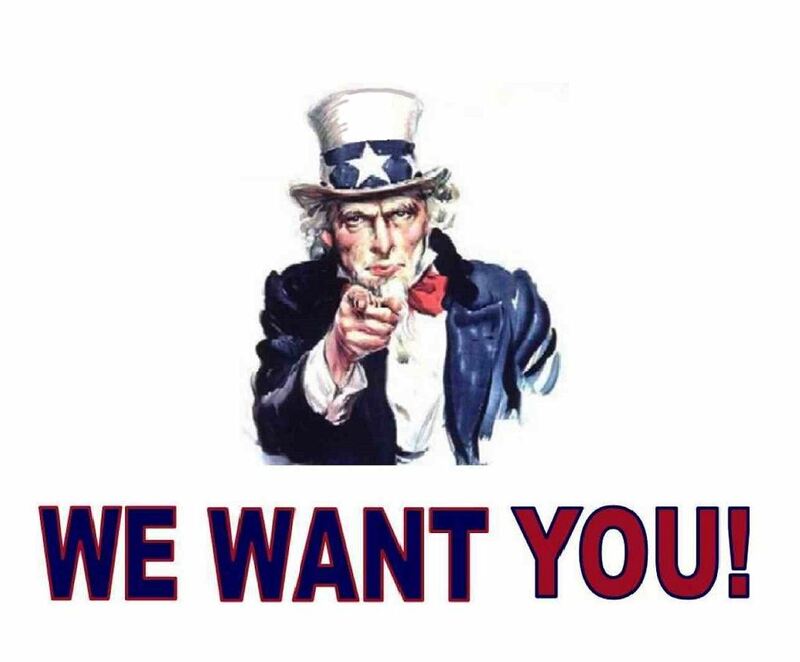 The Midshipmen would enjoy interacting with anyone who can make it. 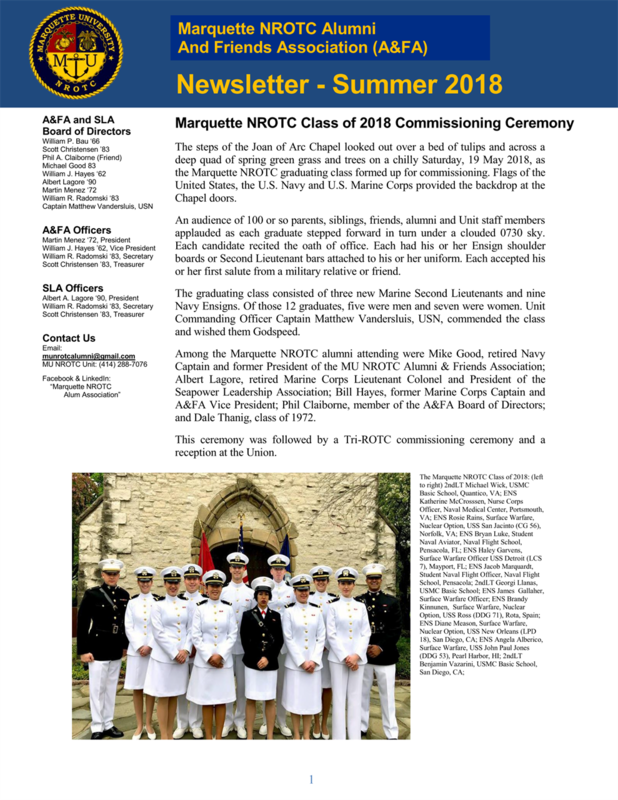 Spring commissioning for Ensigns and 2nd Lieutenants is scheduled May 18th, 2019 at 8:00am on the lawn east of historic St. Joan of Arc Chapel on campus. Past ceremonies were held on the steps of the Chapel, however, crowd size and concern for the mobility of family participants within landscape of the garden has become an increasing concern. The ceremony remains near St. Joan of Arc Chapel, preserving the legacy and experience for commissioning graduates and their families. Click on the newsletter image shown below to open a pdf copy of it. Over the summer of 2017 after their May commissioning, three of our young Naval Officer alumni worked closely with the MU Special Collections & University Archives staff at the Raynor Memorial Libraries to make a high resolution digital scan of every Porthole yearbook that the NROTC Unit held, 57 in all, dating from the first year of the unit’s forming in 1940. Depicted above, left to right are: Katie Blank (Electronic Records Manager); ENS Bryan Troup; ENS Brooks Furleigh; ENS Daniel Peters; Amy Cooper Cary (Head, Special Collections & University Archives). The result of over two years of coordination by your Alumni & Friends Assn (A&FA), this was a superb team effort by these individuals with the support of CAPT Dan Olson, our previous CO at MU NROTC. Due to concerns with loss, the NROTC Unit placed the Portholes into the university archive for retention. This will ensure that this incomparable record will be maintained for the future. With their digitization, they can be more accessible to our alumni with no risk to the originals. A&FA is working on a plan to host as many of these Porthole digital copies as we can on our evolving website / Wild Apricot membership management system – stay tuned for developments. We are also continuing to work with the Archives staff to develop a long term plan to eventually have the Porthole yearbooks hosted on the university’s digital collection website (http://www.marquette.edu/library/archives/). As you might guess, this all comes down to funding and priority. THANK YOU to Jay Burzak, Maj USMC Ret ('73), Bill Sonntag CDR USN Ret ('75) and CAPT Tim Wilkie USN ('95) for help filling in a few gaps! Click on link below to view a pdf copy of the 1968 Porthole.